The recovery in UK house prices could be punctuated by a 6.6% drop in values next year, property group Savills has forecast. It expects that after a 3.7% rise in prices this year, there will be peaks and troughs over five years. This would include a notable drop in 2010 as the number of homes on the market outstrips demand. Meanwhile, the National Association of Estate Agents said five buyers are chasing every property at present. There is widespread agreement among commentators that the lack of people willing to sell at a time when pent-up demand has been released has led to recent increases in prices. The Savills' report suggests that there is a 50% probability of prices falling 6.6% next year, followed by a return to price rises thereafter. Prices will rise by 2.7% in 2011, 5.5% in 2012, and 8% in 2013, according to the forecast. "We have probably not seen the last of house price falls in the mainstream markets yet," said Savills' head of residential research Yolande Barnes. "The timing may be uncertain but there will almost certainly be peaks and troughs during the next five years. "This may sound like doom-mongering but, if we are looking at more volatile markets moving forward, these risks argue for less short-term speculation in housing and more medium and long-term holding of high-quality stock." Meanwhile, the National Association of Estate Agent's report on the market in October suggested that there was greater demand than supply. 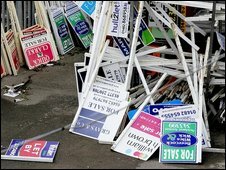 But the high level of demand failed to translate into increased sales during the month, with estate agents selling an average of 7.7 properties each, down from 8.5 in September.